Invergarry Castle was originally an early 17th century stone tower house, founded by the Chiefs of the MacDonells of Glengarry. Standing above Loch Oich on Creagan an Fhithich, in 1645 Glengarry was raided by the Covenanters and then troops under General Monk torched the castle in 1654. Restored by mason Robert Nicholson in the 1660s, new fortifications were built in 1690 but damage was done, when garrisoning Government troops in 1692. 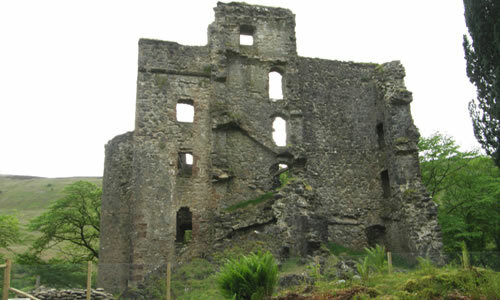 Glengarry regained possession by force in 1715 but the tower was reoccupied by English troops and accidentally burned following the Jacobite uprising. Renovated by Thomas Rawlinson in 1727, he was expelled by Glengarry in 1731 and it then gave shelter to Prince Charles Edward Stuart before and after the Battle of Culloden. In the mid 18th century, troops under the Duke of Cumberland sacked the tower, destroying the wing on the south-west corner. Now roofless, the rectangular main block of the present late 16th or early 17th century L-plan tower house stands to five storeys. On its north-east angle is a round stair tower and the six storeys stair tower which stood in the angle collapsed in the early 1990s. 22 miles south-west is Inverlochy Castle. Invergarry Castle is located within the grounds of Glengarry Castle Hotel, close to the main entrance off the A82. 24 miles north-east of Fort William, on the A82. The site is visible from the driveway, the hotel is open late March to early November.